If you follow me on Instagram, you may have seen my NIECE in a lot of my stories last week!!! 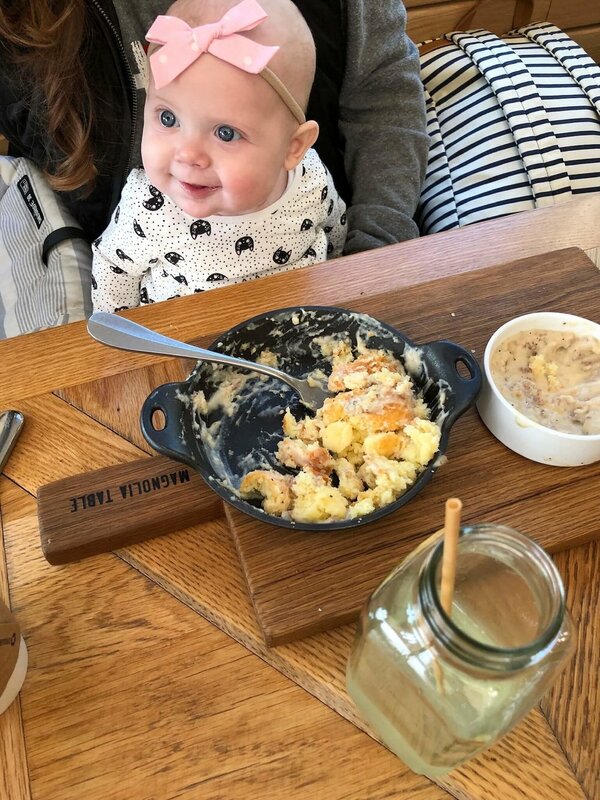 My Step-Mom, sister, and little sweet perfect baby niece came to TX for a few days and we spent a fun, food-filled weekend in Waco! My niece Dorothy thoroughly enjoyed herself, getting to see a lot of new things, being in a ton of mini-photoshoots, and of course being loved on and oohed-and-ahhed at everywhere we went. Have you ever been to Waco, TX? Home of Chip & Jojo, the Silos, and so much more? Wacotown honestly has a lot of character, particularly in it’s downtown area. I loved checking out all of the old buildings, and the cute coffee shops and boutiques that now reside in a lot of those buildings. 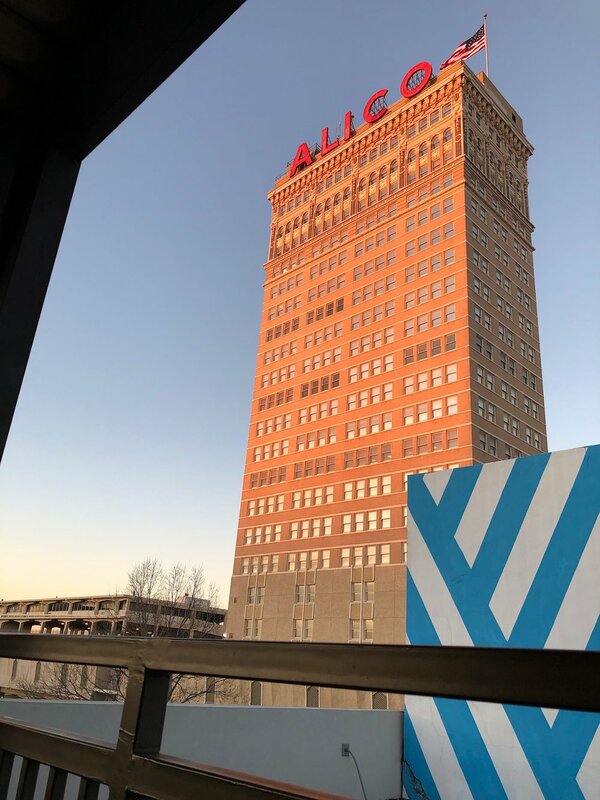 One of the coolest buildings in Waco is the Alico. It’s right downtown, you can’t miss it! The Alico has large, red letters telling you it’s name, which are even lit up at night. My local-Waco friend Dedra actually runs an Instagram page @ispythe_alico which shares posts and stories of the Alico from all different points of Waco. It’s fun to follow the page and see the Alico from so many different perspectives. Speaking of Dedra!! Dedra and I met on Instagram some time ago, and she also did a guest blog post for me in 2017 about Amelia Island (click here to read it!) I love following Dedra for her unique writing style and honest posts. 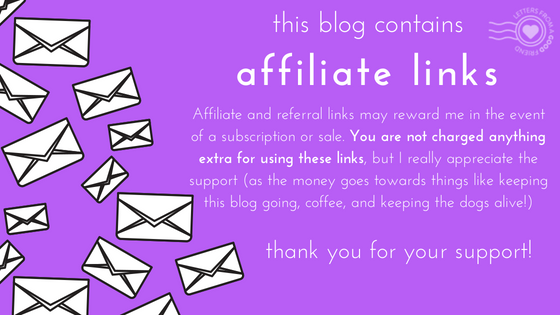 Dedra is a very sweet and authentic person, and she inspires me to work harder at blogging and following my dreams! Also, she has the CUTEST dogs that make appearances on her Instagram stories often, which you all know I love! Anyways, Dedra and I finally got to meet in person while I was in Waco! We met up for coffee and chatted for quite some time, like old friends might. Even though it was the first time we met in person, talking with Dedra came easy (which is saying something since meeting new people usually stresses me to the max) I learned a lot about Dedra and her family, and she gave me so many great recommendations for things to do in Waco! If you love Waco, the Silos, and sweet/kind people, Dedra is someone who you’ll love following! Back to WACO! We shopped and ate, ate and shopped, slept (a little) and then shopped and ate some more. We explored and had so much fun! If you’re planning a trip to Waco, let me help you! I’ll share all of the places we loved, why we loved them, and why you will too! If you go to Waco, you’re obviously going to be going to Magnolia’s Silos, so why not start with this one! In the backyard of the Silos, you will find food trucks!! We saw trucks serving pizza, hot dogs, coffee, sandwiches, and more. *There is also a Magnolia Table food truck here, if you don’t have time to go to the actual Magnolia Table restaurant! We ate at the Cheddar Box, where we all ordered grilled cheeses and tomato soup. As a grilled cheese LOVER, I really enjoyed my “Boss” grilled cheese. The soup was a little chunky for me, but was still perfect for dipping my sandwich into. When you’re at the Silos you obviously have to check out the Silos Baking Co. If you’ve never been inside the bakery, brave the line. Or head to the food truck area where you will find Silos Bakery goods for sale, too! 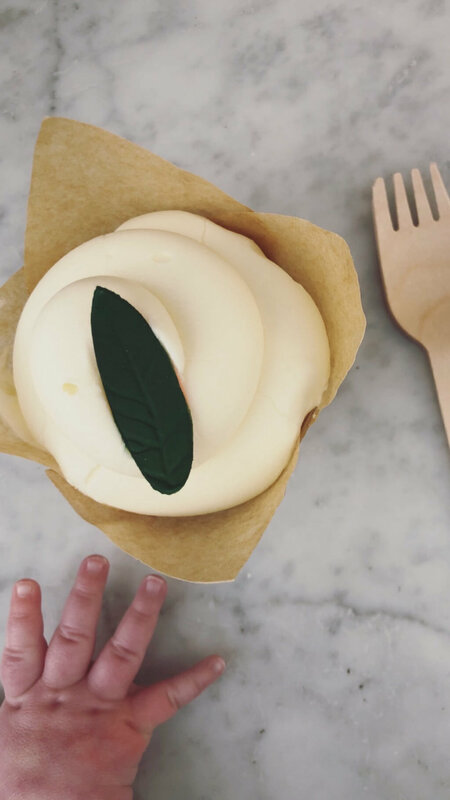 Every Silos cupcake I’ve had has been amazing, but hands down my favorite one has been the Lavender-Lemon cupcake. My mouth is watering just thinking about it! If you’re in Waco, Magnolia Table is probably already on your MUST-DO list, which is good because WOW the food was incredible. Everything we ate was absolutely tasty, from the lavender latte I ordered outside while we waited, to the lavender-lemon donut holes we shared, to the freshly made lemonade, and the homemade tator-tots. I could go on, but you get the point. MY TIP: GO EARLY and GO ON A WEEKDAY. We went fairly early (8am-ish?) on Friday and only waited for about 10 mins! It got very busy after we were seated, and we heard that on Saturday they were turning people away because they were so busy. While you wait, you can get a coffee or other beverages outside, and check out the take-out/gift shop area. When they text you that your table is ready, GO ASAP, they won’t wait too long for you! We went to Moroso Wood Fired Pizzeria because it’s one of my friend Dedra’s favorite places in Waco! We stopped in for lunch and ordered two pizzas (which are considered individual pizzas, but two was plenty for the three of us) Our pizzas were delicious, and the service there was great. It’s hard to find pizza in Texas that this pizza-loving-Ohioan approves of, but Moroso completely has my Great-Pizza stamp of approval! This cookie and ice-cream shop is located inside the Hilton, and parking is available right near the entrance to the hotel. We each ordered a different cookie-ice cream sandwich, and devoured them! Even baby Dorothy got to enjoy some sugary-goodness. The cookies were warm, the ice-cream was Blue Bell (of course), and the service was super friendly. *There are also Pokey-O’s locations in Dallas, Flower Mound, and in the form of food trucks! Dichotomy is located in downtown Waco, and has a killer view of the Alico from it’s upstairs seating area. This is where I met up with Dedra. We enjoyed some delicious hot drinks (it was pretty chilly that evening!) Not only can you get coffee here, but in the evenings you can order cocktails, wine, and beer. The spirits menu is extensive and different, definitely would be a fun place to check out with a group of friends for drinks after a day of shopping. Spice Village is a large store that is filled with booths from tons of vendors, boutiques, and handmade shops. 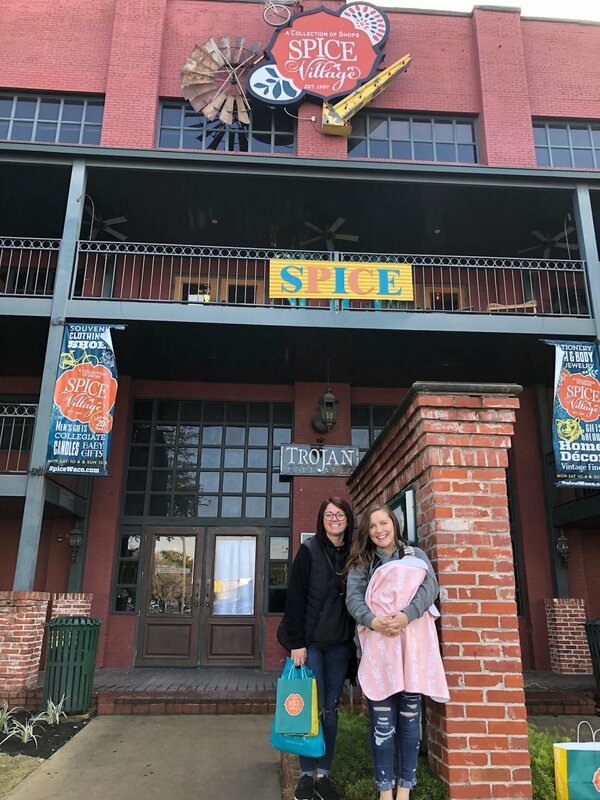 Spice Village literally has something for everyone, from Waco souvenirs, antiques, Baylor gear, baby items, home decor, and boutique style clothing. Plan on spending some time here, as it takes a while to go through all of the booths! But I guarantee that you will find many treasures here to take home with you! The Waco Farmers Market is held downtown (right by the Alico!) every Saturday beginning at 9AM. Unfortunately the weather was rainy and cold the day we went, so there were multiple vendors that were not set up that would usually be there. But that didn’t stop us, or a decent amount of other vendors! The Waco Farmers Market has obviously produce from local farmers etc, but also has homemade pastries, taco and coffee vendors, as well as handmade vendors. I got the CUTEST little cactus from a local gentleman who was really informative about how to care for it, my sister got a few headbands and bibs for baby Dory, and I picked up some fresh Italian bread to take home to Joel. I also got a delicious savory pastry to hold me over until lunch. If you are in Waco on a Saturday morning, be sure to check out this farmers market! Vibe Market is actually located in McGregor, but if you are in Waco and love the Gaines family, you will be traveling here anyways to check out their B&B. Vibe Market is located right on the main road of McGregor and is the most modern looking shop there (and was the only one open when we were there around 5:30 ish on a Saturday evening.) The store is a collection of booths from local boutiques, antiques, and handmade vendors. 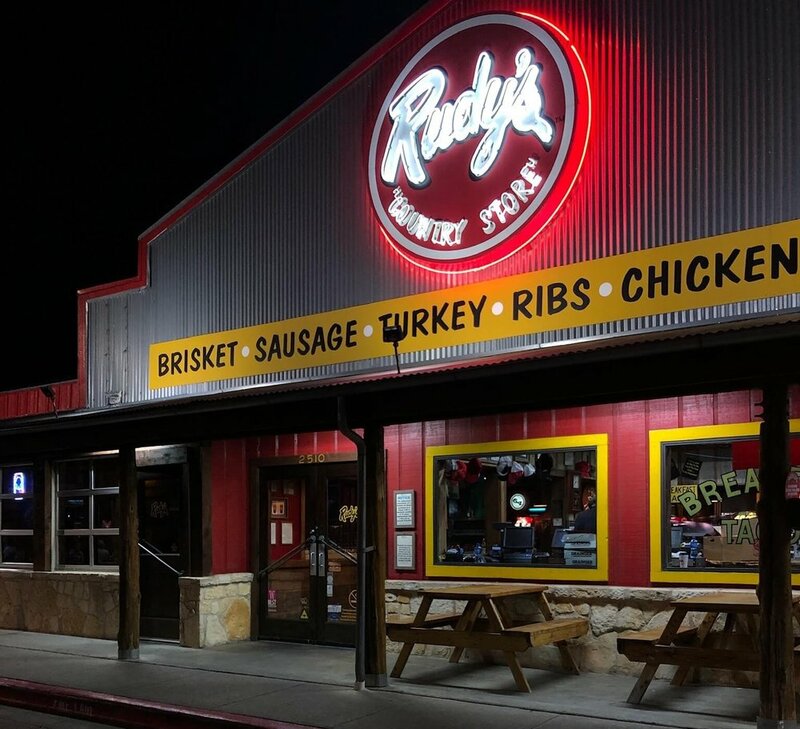 Definitely worth stopping in while you’re in town! The Findery is located about two blocks from the Silos. The Findery is mostly home decor type products, but also has other items like jewelry, clothing, and baby items. This is a very cute store and I love browsing here every time I visit Waco. MY TIP: Park at the Findery (or on the street near it), shop here first, then walk to the Silos. This is a given. If you’re visiting Waco, Magnolia Market is PROBABLY the reason. If not though, be sure to still check it out. The home decor sold in Magnolia Market really is incredible, the tees and sweatshirts are ridiculously soft, and at the very least you will leave feeling inspired (and stuffed with delicious food.) The thoughtfulness and care that is put into every inch of the Silos just beams through as you walk the store and the grounds. Be sure to check out the food trucks, and the Garden & Seed Store out back. Take lots of pictures, and enjoy this special place that the Gaines family has created. MY TIP: VISIT ON A WEEKDAY. Also known as Joanna’s first store. The little store on Bosque is now home to all things on sale from Magnolia Market. This includes slightly damaged goods. There were a lot of good deals here the day we stopped by, and they had items set up outside too. Definitely make the trip to Bosque! MY TIP: When you see something here that you want to buy, or even just MAY want to buy, GRAB IT! You can always put it back if you change your mind, but chances are if you wait and try to find it again later, someone else will already have snatched it up! If you watch Fixer-Upper (which I don’t.. ah! There, I said it) you will know what I’m talking about. The man behind Harp Design Co works with Chip & Jojo on projects for the show. He has his own store, that sells tees and other souvenir items, home decor, and wood work items. It’s a very cute shop, worth the stop. Buc-ee’s is technically a gas station, but I’m telling you now, when you see a Buc-ee’s, you STOP! No matter what. Buc-ee’s is known for their pristine restrooms, their massive souvenir/ merchandise/snack selection, having stupid cheap beverages, and usually a bakery, BBQ station, and other fresh made food for order. If you are driving to or from Waco, you will probably pass one. LOOK FOR THE BEAVER! He never disappoints. 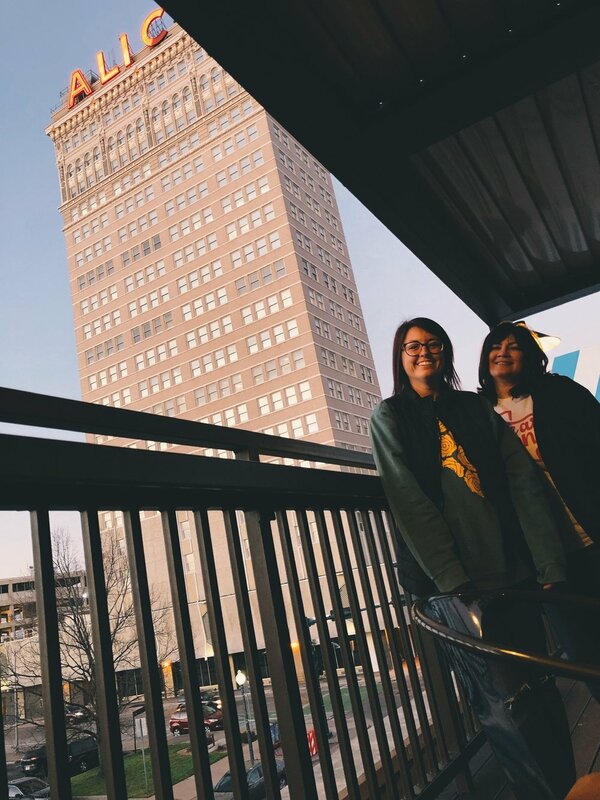 For more Waco tips/reccomendations, head to my friend Dedra’s blog where she shares ALL KINDS of information about her hometown of Waco, Texas!